Renu in a snap! Renu is the smart new line of decorative electrical products from Leviton. Install Renu and get a fresh stylish look, plus the ability to change the colour of any Renu device when you update a room. The Renu line includes switches, outlets, GFCIs, dimmers, and sleek, screwless wall plates available in 20 designer colours. The REG20 20A GFCI outlet has a Reset Lockout feature that prevents Reset if the GFCI is damaged and cannot respond to a ground fault, and is tamper-resistant to meet NEC child safety requirements. Shallow in size, it is self-grounded*, and back and side wired for fast, easy installation. The terminals are designed to withstand high torque and resist wire pullout. A Renu 15A-125VAC tamper-resistant GFCI outlet is also available. Use only with Renu wall plates. *When installed in a properly grounded metal wallbox. Renu is the smart new way to update the look of a room, in a snap. Renu is the a new line of decorative electrical products from Leviton which includes switches, dimmers and receptacles with faces you can update yourself whenever you're ready for a new look. Available in 20 popular paint colours, Renu turns the electrical device into a decorative, easy to change accessory. When only the perfect colour will do, Renu! Renu in a snap! Renu is the smart new line of decorative electrical products from Leviton. Install Renu and get a fresh stylish look, plus the ability to change the color of any Renu device when you update a room. The line includes switches, outlets, GFCIs, dimmers, and sleek, screwless wallplates available in 20 designer colors. 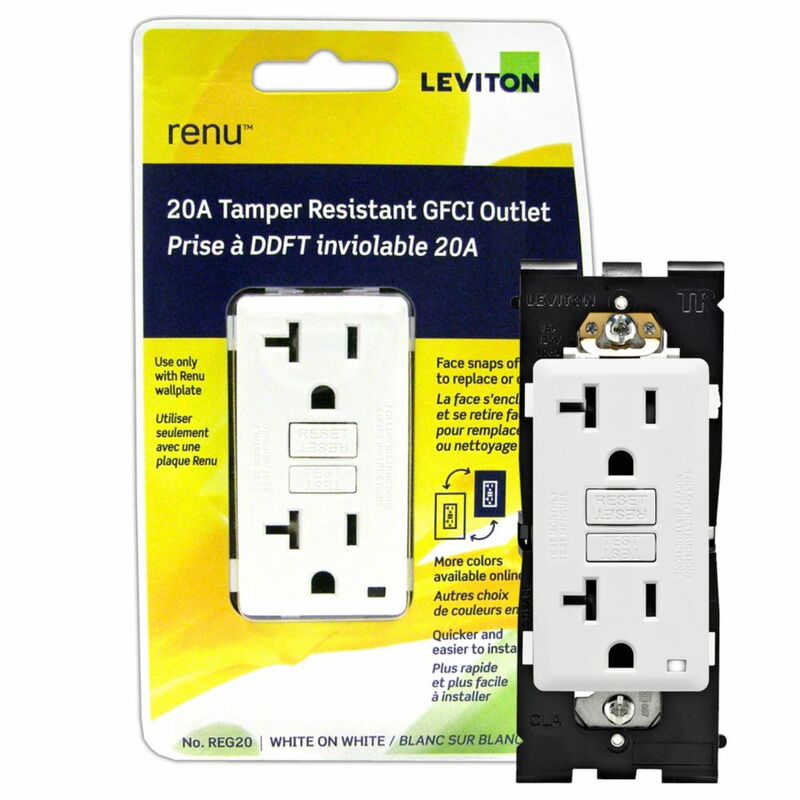 The Renu face plate RKG15 makes it a snap to change the color of Renu 15A tamper-resistant GFCI outlets, without rewiring or needing an electrician. Just order a face plate in the color of your choice and follow the simple directions to replace the existing face with a new hue. Snap on a wallplate (sold separately), and you're done. Base Unit for 20A GFCI Receptacle (Face and Wallplate not Included) Renu in a snap! Renu is the smart new line of decorative electrical products from Leviton. Install Renu and get a fresh stylish look, plus the ability to change the colour of any Renu device when you update a room. The Renu line includes switches, outlets, GFCIs, dimmers, and sleek, screwless wall plates available in 20 designer colours. The REG20 20A GFCI outlet has a Reset Lockout feature that prevents Reset if the GFCI is damaged and cannot respond to a ground fault, and is tamper-resistant to meet NEC child safety requirements. Shallow in size, it is self-grounded*, and back and side wired for fast, easy installation. The terminals are designed to withstand high torque and resist wire pullout. A Renu 15A-125VAC tamper-resistant GFCI outlet is also available. Use only with Renu wall plates. *When installed in a properly grounded metal wallbox.